"Salmon and blueberries deliciously combine in this summer dish." Pour 1/2 cup chicken stock, vinegar, orange juice, and honey into a saucepan. Bring to a boil over high heat, then reduce heat to medium. Dissolve cornstarch in 1/4 cup of chicken stock, and stir into the simmering sauce. Cook and stir until the sauce thickens and turns clear, 1 to 2 minutes. Stir in the blueberries and chives, and keep warm over low heat. Preheat grill to medium high-heat. Brush salmon with oil, and season to taste with salt and pepper. Grill until the fish flakes easily with a fork, about 3 to 4 minutes per side. 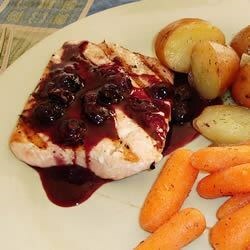 Serve with blueberry sauce.